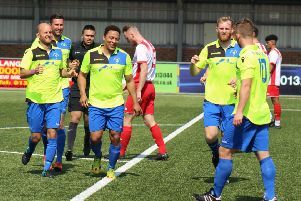 Little Common Football Club saw its six-match unbeaten run come to an end with a narrow 1-0 defeat at home to Eastbourne Town. A solitary second half goal decided the Southern Combination League Premier Division derby in favour of Town on a bitterly cold Saturday afternoon. Common made two changes to their starting line-up, with Lewis Parsons and Lewis Hole coming in for Jordan Harris and Adam Smith. The Commoners defended the wind in the first half and unsurprisingly spent long spells in their own half, but almost opened the scoring after just three minutes. Jamie Crone raced towards the area only to be pulled back and the resulting free kick by Russell Eldridge clipped the post. The visitors went on to enjoy long spells of possession but failed to really threaten Matt Cruttwell in the Common goal, although he was called upon after half-an-hour to palm away a rasping drive from the edge of the area and then make a smart save at his near post just before the interval. Common saw more of the ball in the second period, but it was Town who made the early running as they searched for the opening goal. Cruttwell once again saved well when tested from distance, but was finally beaten in the 52nd minute. Tom Vickers drove at the Common defence before unleashing an effort which Cruttwell did well to save, but Sam Carrington was the quickest to react and knocked in the loose ball. Town almost made it two, but were denied by an unconventional Wes Tate goal-line clearance before a scramble from the resultant corner was hacked to safety. With the game remaining 1-0, the Commoners sensed a share of the spoils and began asking questions of their own. Tate was unable to connect from a tight angle following a Hole header and then Hole couldn’t get on the end of a ball over the top when well set. With the match heading towards the 90-minute mark, Cruttwell - who scored against Bedfont Sports in the FA Cup during August - came forward for a corner and was unfortunate to see his header cleared off the line. The visitors should have sealed the match from the subsequent attack when Bradley Pritchard ran through on goal, but his shot veered wide with the goal gaping. Common: Cruttwell, Paul (Harris), Feakins, Ward (Ryan), Parsons, Eldridge, Tate, Pool (Smith), Hole, Crone, Ellis.